Indians Baseball Cards: I won!! Holy Smokes, I won! A little while ago, I posted a message on here about an essay contest regarding a new segment potential for Baseball Tonight. Well, my essay won!! It turns out, the folks at SportsCardFun couldn't decide between two essays, so I am sharing the win with another writer, which is perfectly fine by me!! 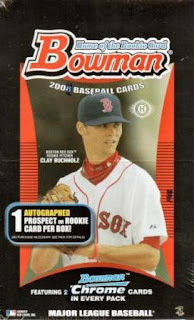 For my prize, I get a HOBBY box of 2008 Bowman baseball cards! Now, that is sssssmokin!! Initially, the program would air once or twice per week, repeating. That is, the same episode would show a couple times a week to give viewers the opportunity to catch it if they missed it. The bird's eye view of the program: MLB players, card execs, club managers, and/or prominent bloggers on the subject would appear in a 90-120 second segment (may be produced, but would probably work better "live") in which they discuss the hobby as they see it. Initially, guests would be selected based on their positive experiences, thoughts, and love for collecting. Players and managers could discuss their favorite cards, or even their own cards! Bring in Hall-of-Famers to talk about collecting as kids (and as adults, if they still do). The segment could be sponsored by card manufacturers, but they would have no input on the content (unless they happen to be the featured guest of the day). In fact, ideally, specific manufacturers wouldn't be discussed so much as the state of the hobby and broad ideas regarding the types and styles of cards (for example, discussion on throwbacks, game-used, autographs, etc). If the current hosts of Baseball Tonight collect, then they can serve as the moderator/interviewer. If they don't, however, then an 'expert' card collector/hobbyist should be brought in as the host of the segment. Card collecting basically has two schools of thought - nostalgia and profitering, and they are not always mutually exclusive. The first three or four episodes should focus on nostaglia. In fact, if you could get the owner of "THE" Honus Wagner to come on, or the owner of some other rare card to be the pilot offering, that would set the tone of the program. The program should get personal. WHY do they collect? HOW LONG have they been collecting? WHO/WHAT are some of the guests favorite players/items to collect? The audience will enjoy hearing that their favorite player(s) collect the same player(s) or items. WHAT do the guests think about the current state of card collecting? WHY SHOULD KIDS (or anyone) COLLECT? The program should SHOW CARDS. Keep the basic format the same until the program grows. Ask the same questions (or types of questions) to each guest, so the viewers know what to expect. Tease the viewers with upcoming guests and as the program matures, with new program features. Episode 1 should feature Tony Gwynn, Cal Ripken Jr, a HOFer, or Ben Henry (blogger). Seriously. Ben Henry has been following baseball cards pretty in-depth and has one of (if not THE) most successful card blogs out there. Ask the guest the questions posed above. Have the guest either bring a few cards from his/her collection or have your folks find images they can use. Episode 2 should feature another prominent person (a HOFer) or feature a collector that has a unique spin on the hobby (someone who collects only a certain team, certain player, etc). A great example would be the winner of your most recent essay contest. Patricia and her daughters are amazing people who collect cards based on smiles, mid-air antics caught on cards, players using old technology, etc. That shows viewers that not everyone is out there for the money in it, and not everyone uses the same approach to collecting. Episode 3 can use either ideas/people not used in the previous two episodes, or bring in a current player that Baseball Tonight is already going to be interviewing. This will save on costs to the network, anyway. In fact, that might not be a bad tie-in as the majority of the segments. Start each program off with the person being interviewed talking about card collecting for 90-120 seconds, do the rest of the show as usual, then when the time comes, bring the player/guest in for their program segment. Future segments could feature certain cards, certain players, etc. As the segment grows in popularity (and possibly length, though no more than 4-5 minutes), it could actually be divided into a "Waxing Nostalgia" (play on words!) and a "Hottest Cards" sub-segment, covering both the feeling most collectors get from collecting and the profiting aspect many sellers wish for. The program possibilities are limitless once the program gets rolling and becomes an established part of the Baseball Tonight family. How do we make it a reality? First, take all the entries and compile a list of everything GOOD you see. Everyone will have different ideas and no one will cover everything, so make an "everything" list. Second, take all the ideas that are marginal or would flat-out not work. Compile those as well. Those can be used to keep the program on track and help you see what might be pitfalls in the future. Third, write a letter to the programming execs at ESPN. Don't mess around here. Give them enough information to whet their whistle, and then request an in-person meeting to further discuss the program. Fourth, get the MLB involved, if only for the legal matters (whatever they might be). Find out who at the MLB would need to be in on the program discussions (not on-air, I mean production, legal, etc). I would also contact card companies about sponsorship, with details to be hammered out (making sure they have NO say-so in content). Remember, the final question is ALWAYS, "What's in it for us?" ESPN benefits because they are adding programming that will reach a specific audience. They will also possibly bring in peripheral demographics because word will get out (more on that in a second) and collectors who do not watch Baseball Tonight will tune in to see the latest Baseball Cards Tonight segment. Sponsors will benefit because they will have very little cost in making a 15-second commercial for their product. This will reach the folks that do not browse the aisles at Wal-Mart, or hit the card shows, or may have long forgotten there was a card shop in town. Getting the word out - Do it all. TV spots on ESPN, Twitter, Bloggers, Online ads with MLB, ESPN.com, Podcasting, etc. This is a VERY exciting prospect, and given the right people in charge with the right motivation, this CAN be a reality! Believe me, if I get a say in any of the actual planning, both you (Mario) and The Infamous Tatiana will make an appearance on the show. I have a LOT of additional ideas, and there are quite a few card bloggers that would serve as perfect hosts/guests because of their specializations! Of course, your appearance on an episode may depend on whether or not I get an Auto'd Tatiana card... LOL, just kidding! Congratulations! Sounds like a great segment. I hope it happens. I'll bet Olberman would get involved for a segment. I've read that he is a collector. Also, let us know if your prize arrives in a big box marked "fragile". I think that's italian. Maybe it's a bowling alley. Great essay, on point all the way! Definitely a lot of fun. Congratulations! No odd music playing in the background, either.